Norman MacBeth (England/Scotland, 1821-1888) oil on canvas three-quarter length portrait of a British Officer, possibly Lt. 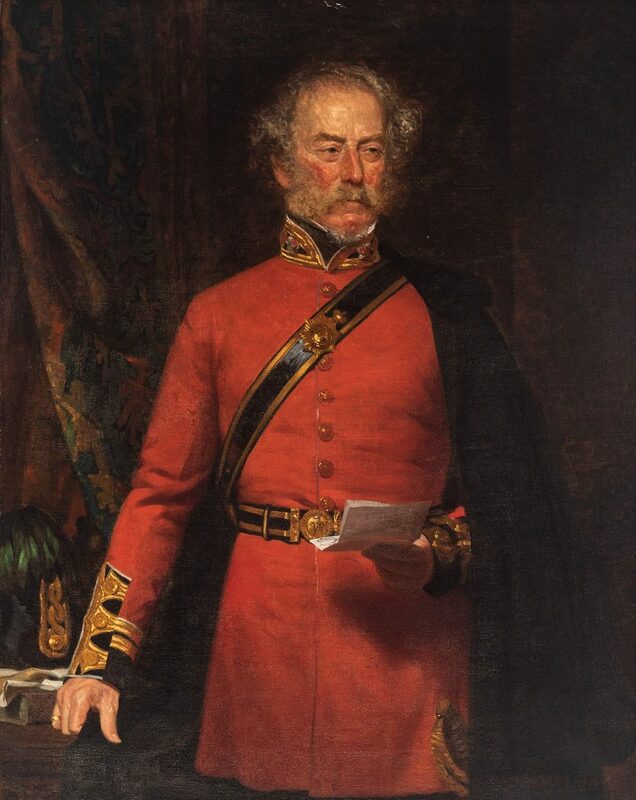 Colonel John Pitt Kennedy (1796-1879) or General Sir James Shaw Kennedy (1788-1865). 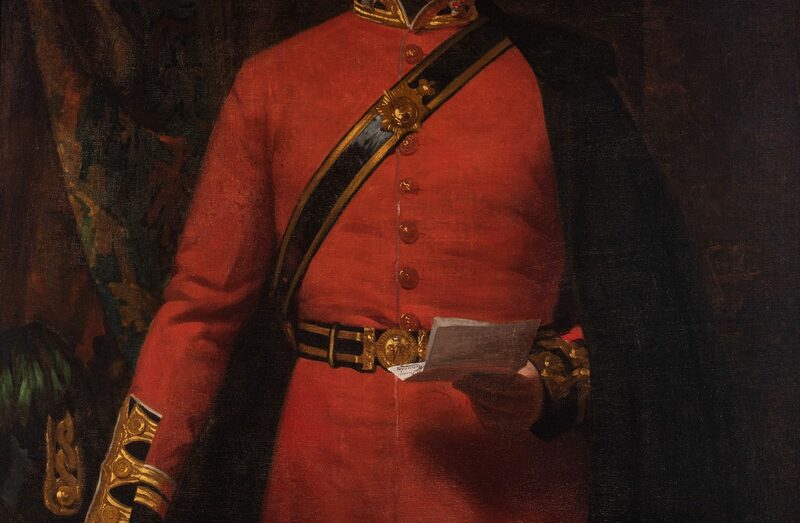 The subject, with gray hair and moustache, attired in his red uniform coat with Victoria Regina buckle and sword partially visible beneath his cloak, is depicted standing with his right hand resting atop a book on a table and left hand holding a letter. Patterned drapery hangs in the background. The signature corner on letter reads "friend, Kennedy". 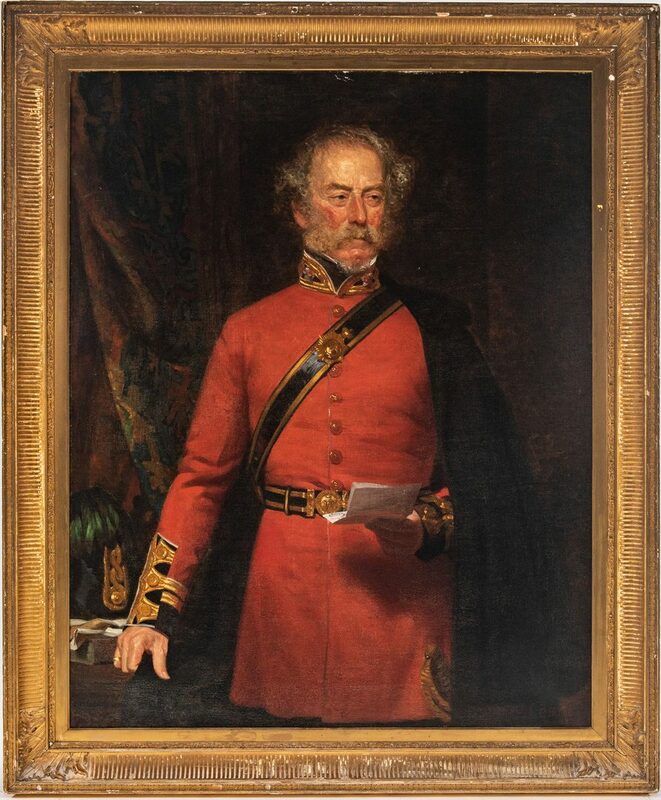 Signed "Norman Macbeth" and dated "1864", lower right. 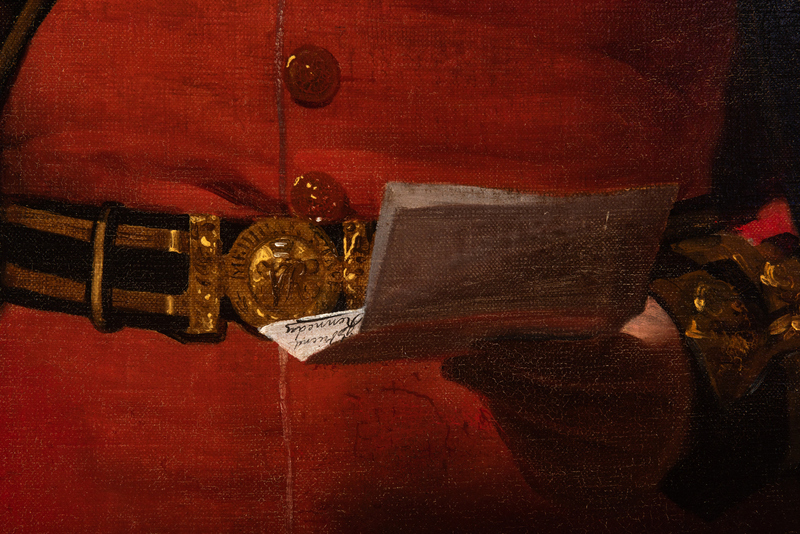 Indistinct writing en verso of canvas. Housed in the original giltwood cove molded frame with guilloche and floral scroll bands and carved corner elements. 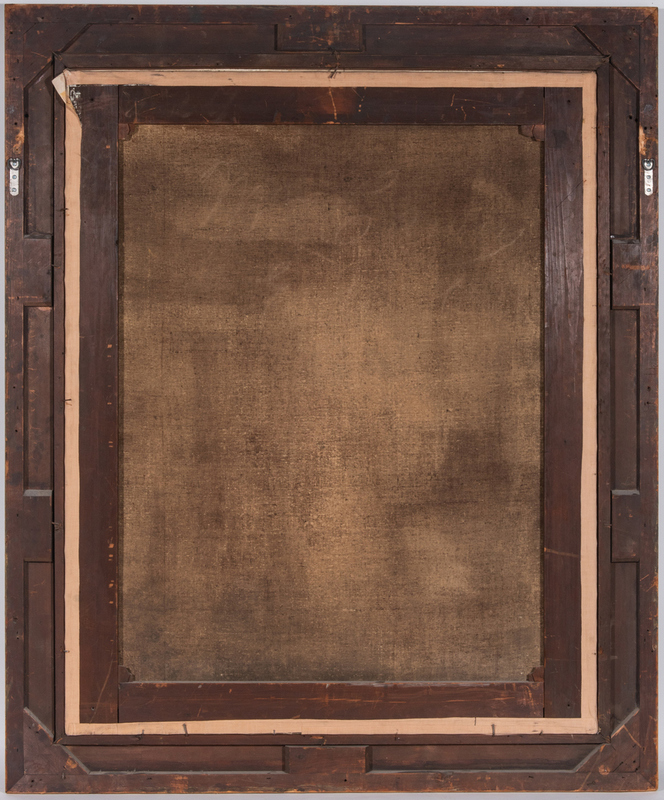 Sight – 49 1/2" H x 30 1/4" W. Framed – 60" H x 49 1/2" W. Mid 19th century. Provenance: a Nashville, Tennessee estate. Biography: Norman Macbeth was born at Greenock, Scotland, and apprenticed as an engraver before going to London to study at the schools of the Royal Academy. He moved on to Paris, where he painted copies in the Louvre. 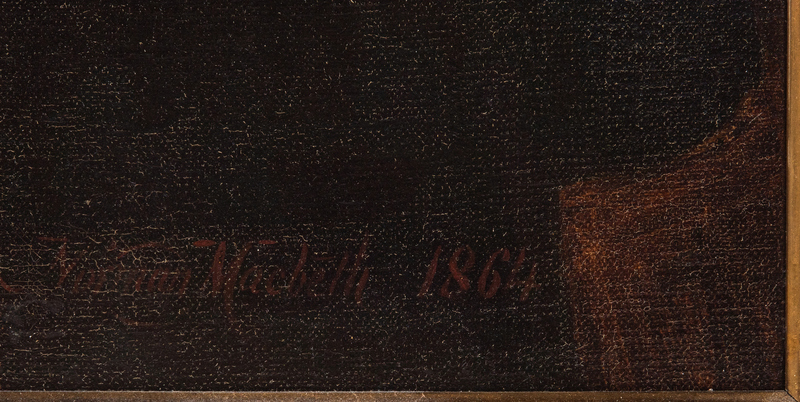 In 1845 Macbeth established himself as a portrait- painter, practicing in Greenock and Glasgow. By 1845 he was a regular contributor to the exhibitions of the Royal Scottish Academy, and in 1861 he went to Edinburgh. 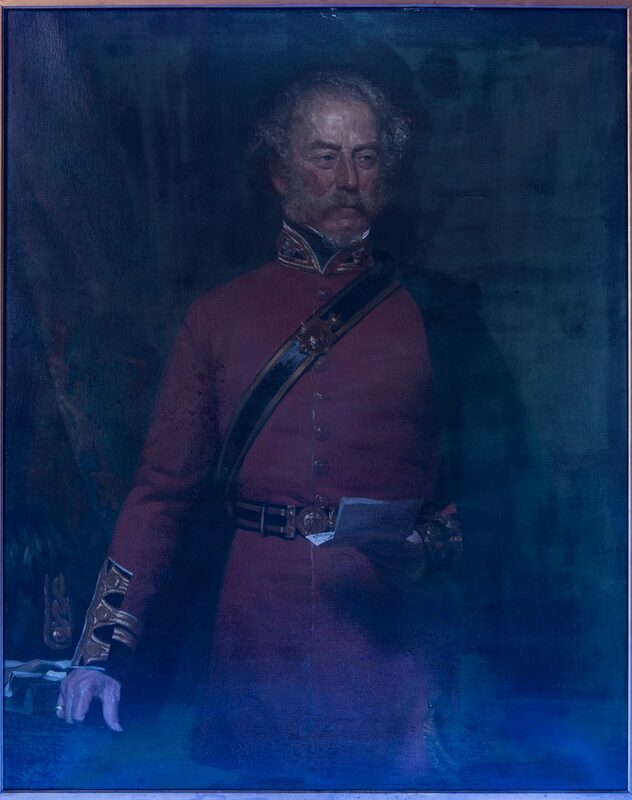 There he was successful as a portrait-painter, and was elected a Royal Scottish Academician in 1880. About two years before his death Macbeth moved to London. There he represented the Royal Scottish Academy as trustee of the British Institution Scholarship Fund. 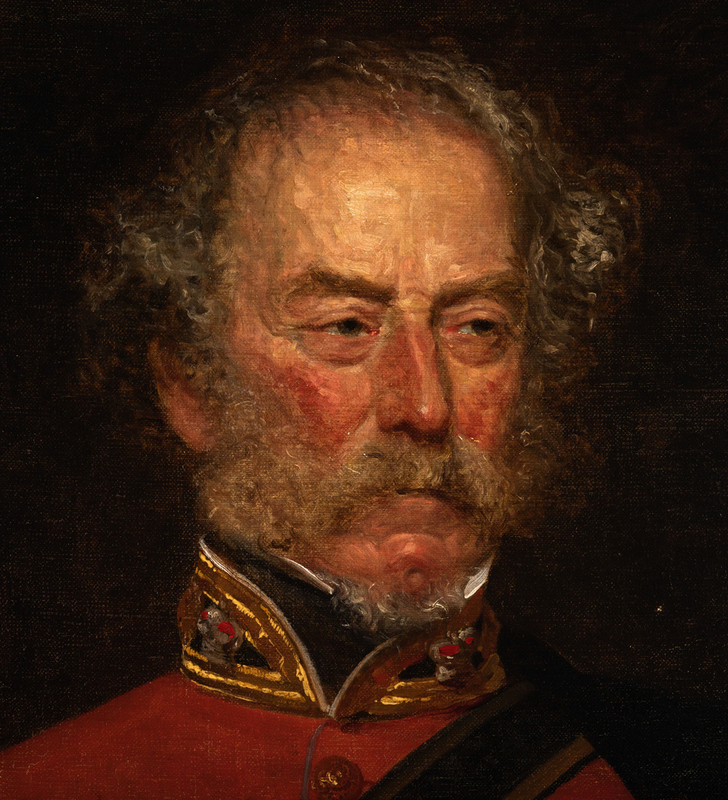 Macbeth's portraits were considered unmistakable likenesses. 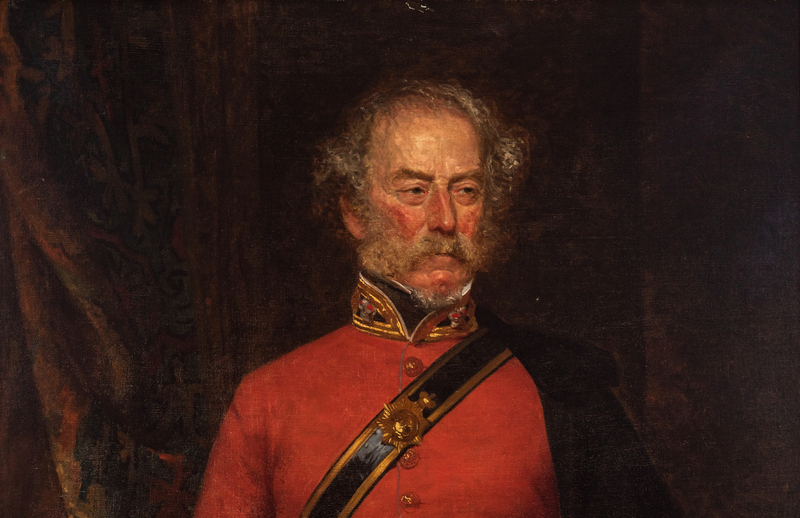 His works include the portraits of Sir John Steell RSA, acquired by the Royal Scottish Academy, and that of the Rev. Dr. Lindsay Alexander, by the Scottish National Portrait Gallery. (source: Askart). 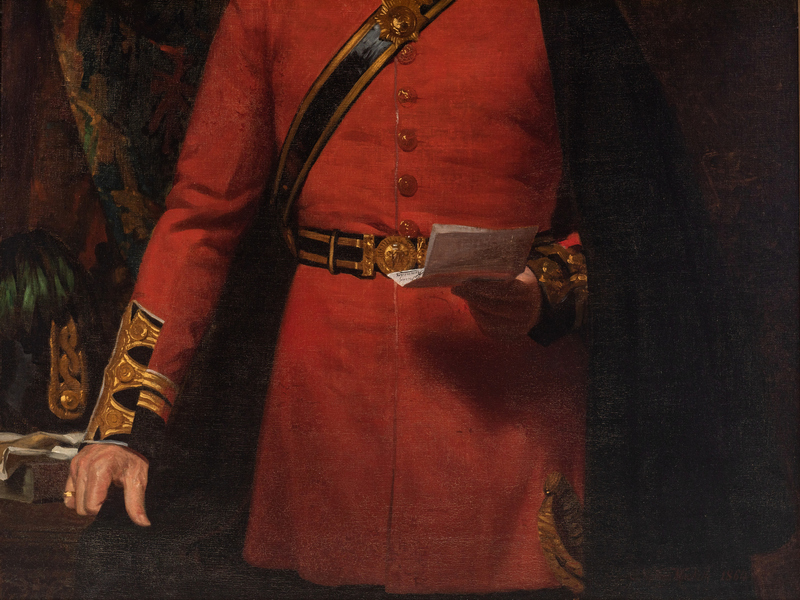 CONDITION: Painting is in good condition with previous restoration evident. 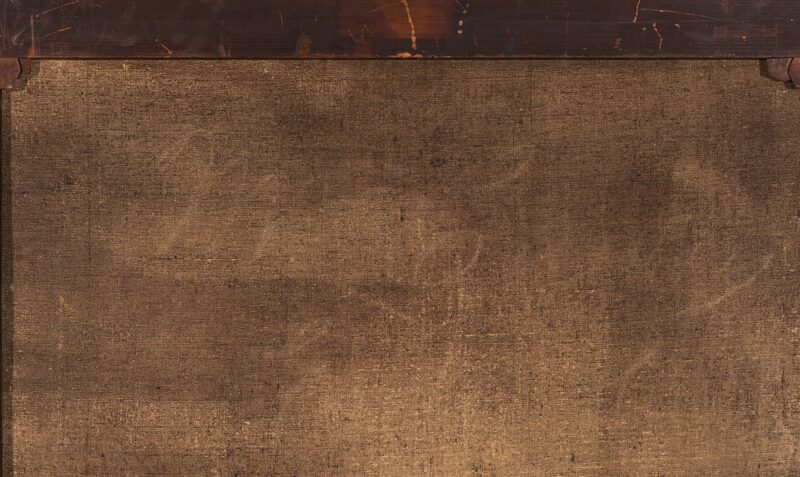 Two 1" L scratches, center top, background; 4" line of slight tenting upper right quadrant, background; general craquelure most noticeable lower half of painting. Painting has 5 significant areas of inpainting to craqulure lines: lower left corner 7"H x 5"W; lower right side 5"H x 4" W; end of left sleeve 3"H x 2"W; below letter 2"H x 3"W; and under left armpit 8"H x 3"W, see black light image. 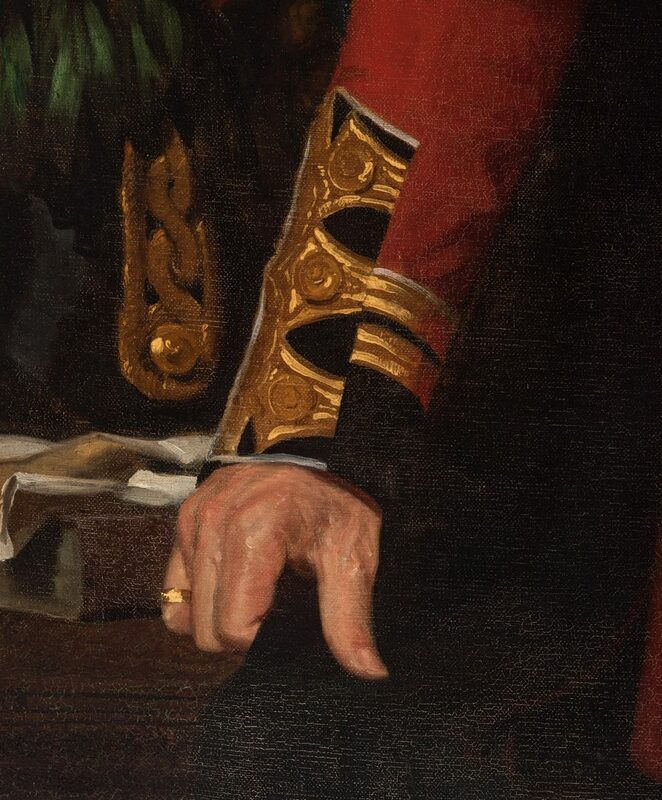 Sitter's face appears to have been professionally cleaned with 1/2" D circle overpainting to sitter's left temple. Frame: multiple cracks (especially to corner ornaments) and small edge losses, up to 1".